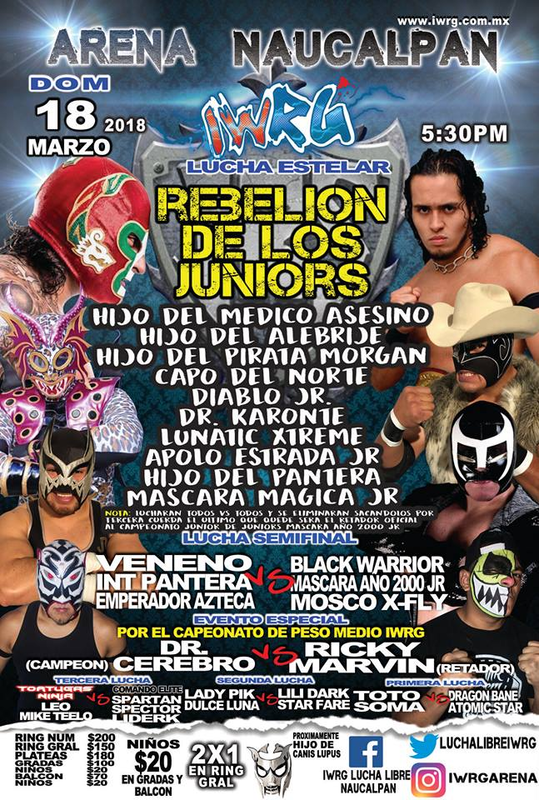 3) Demonio Infernal & Eterno b Relámpago & Súper Brazo Jr.
non-title preview of next week's title match. Dr. Cerbero had his hand on the ropes on the pinfall but the referee missed it. Very good match. Mascara 2000 gave Spartan a Martinete. Hair bet was referees Baby Richard (Panteras) and Capu (Traumas), who were both referees in this match and ended up fouling each other. 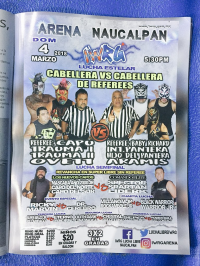 Trauma I went to get a new referee and found Chabelo. 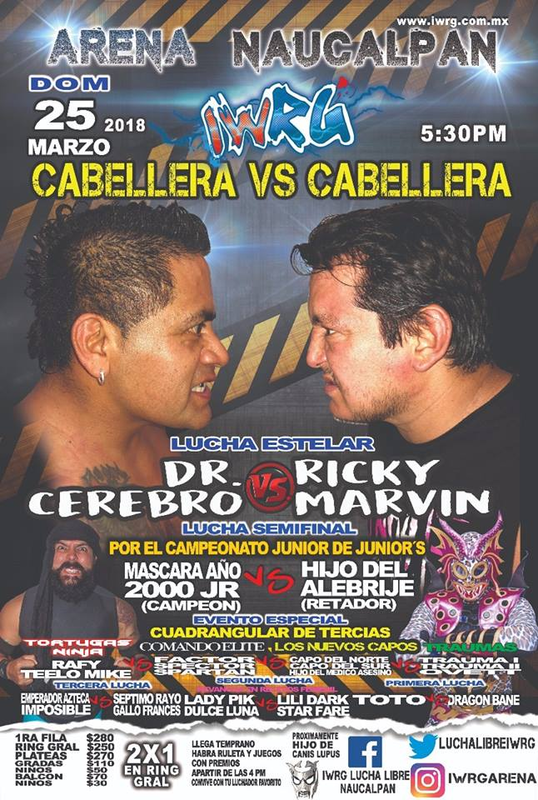 Trauma II had Pantera pinned in the mean time, but Pantera reversed the pin when Chabelo arrived and Trauma II was pinned. Capu lost his hair. Spector helped Eterno win with a martinete on Leo, which did not please the Capos. 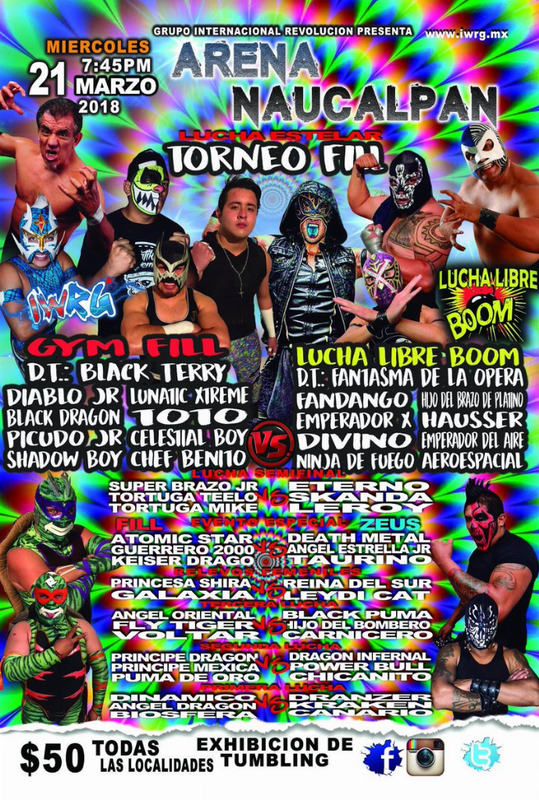 Fantasma had Lucha Libre Boom wrestlers (Carta Brava, Ninja de Fuego, others) with him to help. That ended up getting him DQed. Lunatik Extreme and Toto (two of Ovett's sons) made the save, along with Black Terry. This set up a FILL/Boom Copa Higher Power for next week. 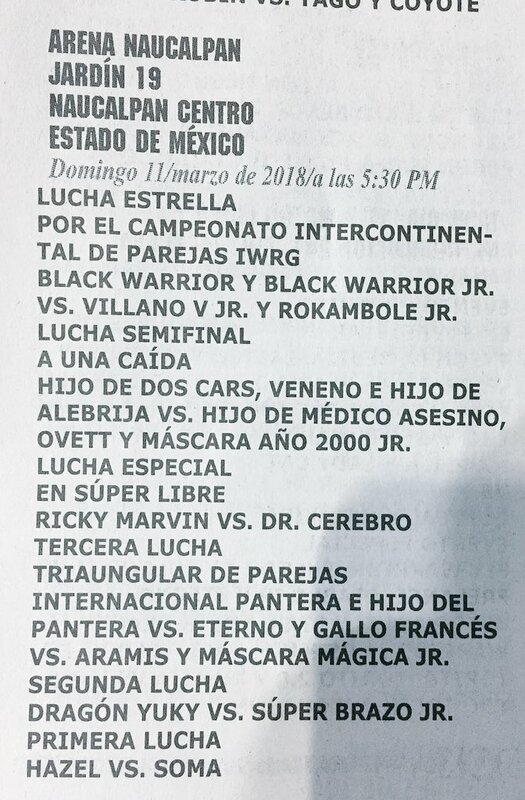 Marvin wants an IWRG IC MIDDLE title match. 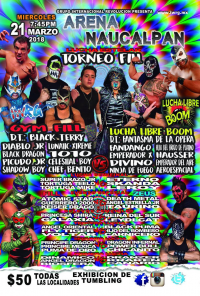 Eliminations: Dinamic Dragon, Panteras & Araims, then Capos after a Spector chair shot to Mascara 2000. 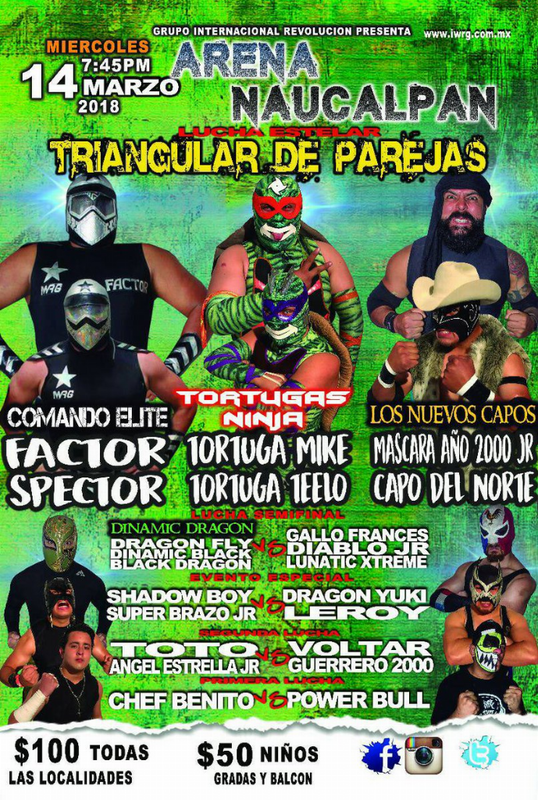 Tortugas got involved after, challenging the Comando Elite. Warriors fall on 3rd defense after Warrior Jr. fouled both Villanos. Villanos are 32nd champions. 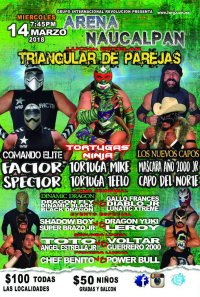 Villano and Black Warrior (Sr) agreed to a singles math. Tortuga beat Nuevo Capos, Factor fouled Mike, Teelo fouled Spector, referee caught Teelo but not Factor. 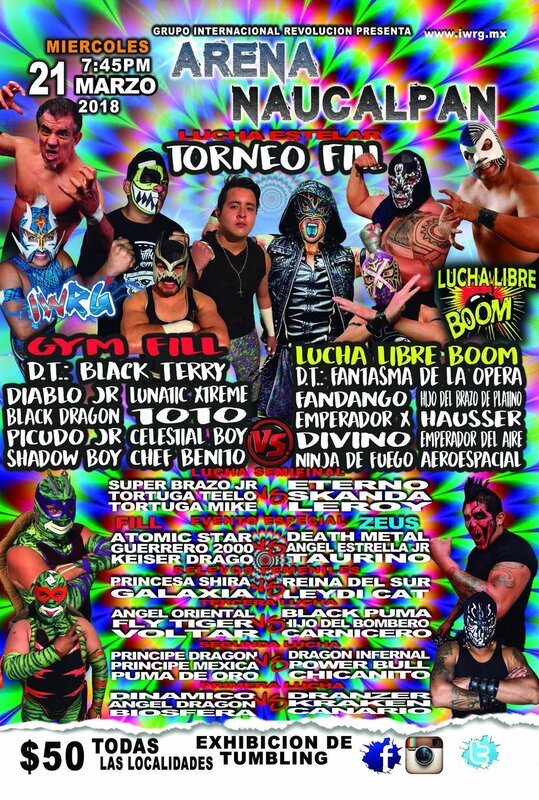 straight falls, Factor interfering to give a piledriver to Leo. 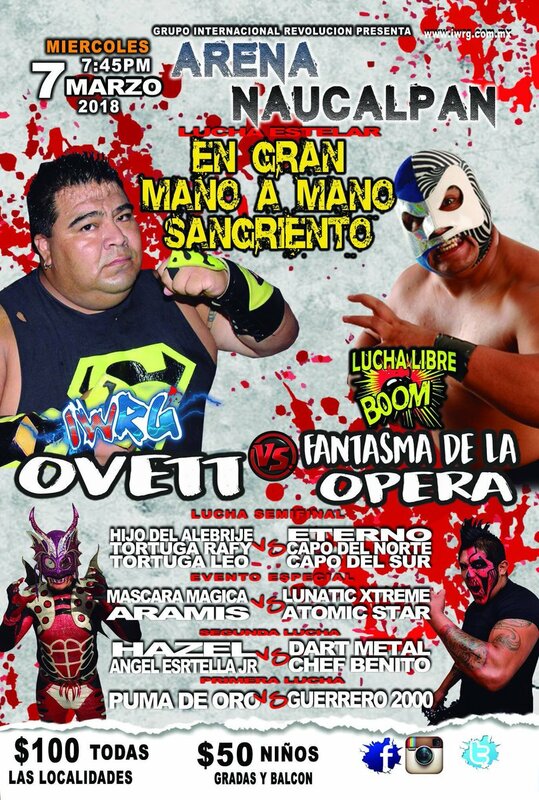 Cerebro used the ropes to win. first defense. Moved up a spot. 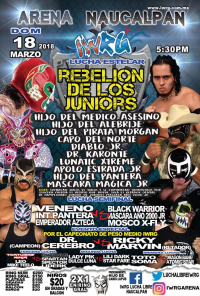 Hip Hop Man made his return to IWRG by being added to this match. 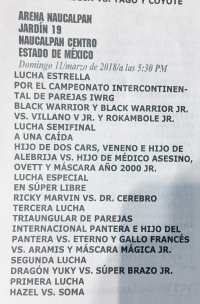 Hijo del Alebrije, who's technically a junior but actually (supposedly) Alenrije's nephew, won the mach and a title shot at Mascara Ano 2000 Jr.
the Comando Elite were DQed.